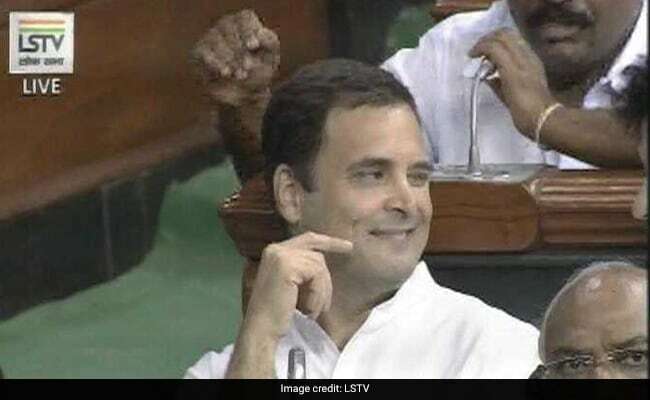 Rahul Gandhi, Congress President, did two unusual things in parliament yesterday. Gandhi's savage speech which counted the "jumla strikes" made by the Narendra Modi government was a sharp indictment of Modi complete with references to "suited booted" billionaire cronies. Surprisingly it was a better speech than the long rambling one delivered by the "master orator" Modi. Perhaps this was because of the second unusual thing done by Gandhi: a stealth hug to ambush Modi who was patently taken by surprise and did not want to reciprocate. Modi then semi-recovered and shook hands with Gandhi. Gandhi took on the moniker of "Pappu" which the BJP uses to attack him and said, "You can call me Pappu - but I will not hate you." Gandhi then proceeded to exchange a cheeky wink with colleague Jyotiraditya Scindia. First the hug, then the wink. Rahul Gandhi was on fire with the optics. Gandhi's speech came after newly - appointed chief whip of the BJP, Anurag Thakur, keen to earn his spurs, openly threatened on the floor of the House that he would not let the opposition speak. Gandhi did not seem deterred. When he referred to Amit Shah in his speech, the uproar and howls of rage in the treasury benches forced the adjournment of the House. 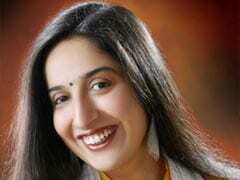 Neither the angry shouts nor the scripted laughter when Gandhi made his trademark fumbles in Hindi stopped his speech. At one point, he taunted Ananth Kumar, Parliamentary Affairs Minister, "daro mat (don't be scared)", to suggest that government leaders were worried about the content and impact of his address. 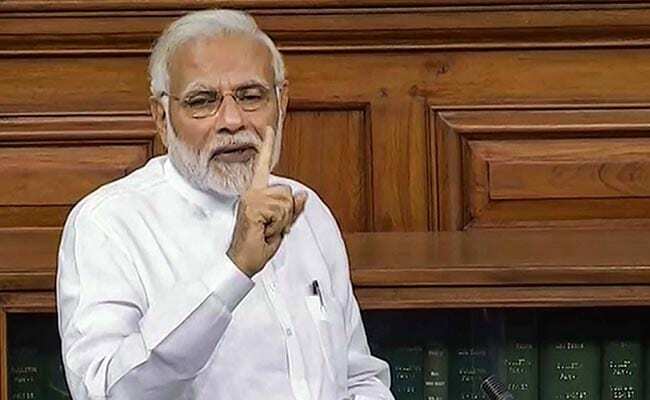 PM Modi repeatedly described the Congress president Rahul Gandhi's attacks as "childish"
Modi in his long and rambling reply was not his usual sharp self. 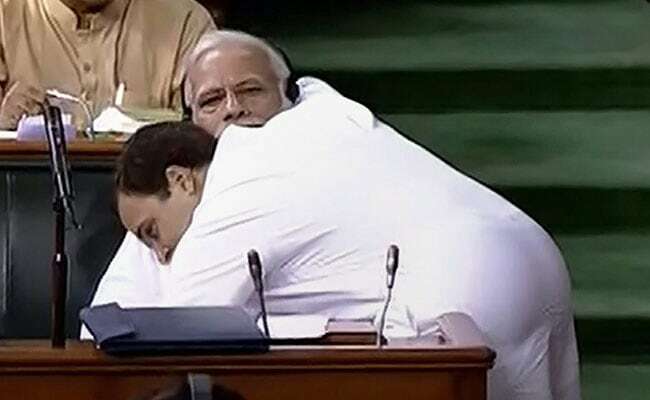 He mocked Gandhi's hug as an unseemly haste to occupy the treasury benches, but he seemed off his game. At one point, he mimicked Sonia Gandhi's Italian accent which seemed in poor taste in the House by the occupant of the highest office. The BJP won the vote of no-confidence with ease but that was not the takeaway from the debate. Gandhi with his unconventional move had the floor, the headlines and the image that everyone would be left with. Also damaging for the BJP: its fractious ally Shiv Sena, which had agreed to back the government after Amit Shah's outreach over a phone call, at the last minute decided to walk out. Like the hug, this probably left Shah seething. Gandhi's sharpest-ever political attack on Modi was designed to ensure that he was seen as the chief contender to the PM. And despite the BJP's claim that it does not take Gandhi seriously, an array of cabinet ministers and spokies are always deployed to target him - does this prove how lightweight he is? The Modi-Shah duo changed course and abandoned the Land Acquisition Ordinance after Gandhi's "suit boot" jibe found traction; now, changes to the Right to Information Act are being withheld after Gandhi attacked it. The BJP's top strategists had planned that the no-confidence motion would be a master stroke. Modi would be showcased with an ace speech, launching his 2019 campaign, while the vote would showcase the divisions in the opposition's stated Grand Alliance. Said a senior BJP leader, "Modi is already spending every weekend campaigning in UP and he planned to tear into the opposition and highlight that in his meeting with farmers in Shahjahanpur in Uttar Pradesh today". 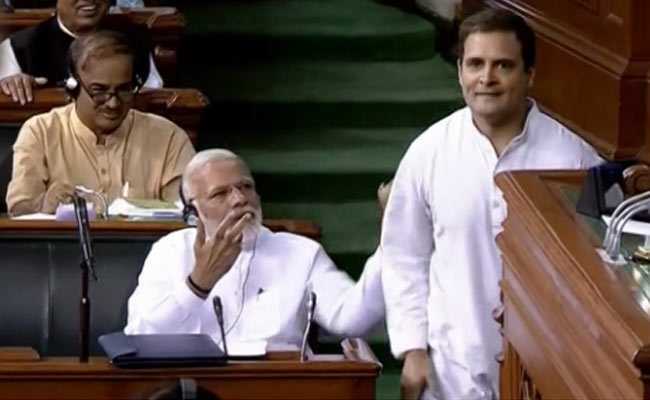 Even an intervention by a clearly partisan Speaker Sumitra Mahajan who disapproved of the hug later, though she was seen giggling when Gandhi was actually hugging Modi, did not take away from the opposition's glee despite Modi bragging a walkover as he taunted, "You can bring another no-confidence motion in 2024." Gandhi has positioned himself as a leader with a sense of humour and a sneaky move or two to beat the PM and Shah, master strategists. His speech was a sharp and direct attack displaying none of the flakiness of the past. Sure the wink could have been avoided but is it really a big offense given that parliament routines witnesses sexist jibes, violent attacks and abuse? That said, it will take a lot more than a jhappi for Gandhi to win away voters from Modi. But for now, this was his moment. No taking that away.